The Nokia 6303 classic is a "beautifully balanced" phone, it giving us a pleasure to see, hold, and use. 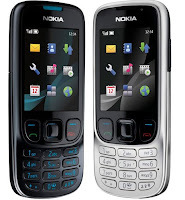 The Nokia 6303 classic combines enduring design with up-to-date features. - Enjoy the feel of durable stainless steel. The compact size and rounded design fit comfortably in you hand. - Capture and share special moments right from your phone. It's easy to take photos and videos, and exchange them on-line with friends and family. - The up-to-date features are easy to learn and use with a straightforward, intuitive interface and large display.